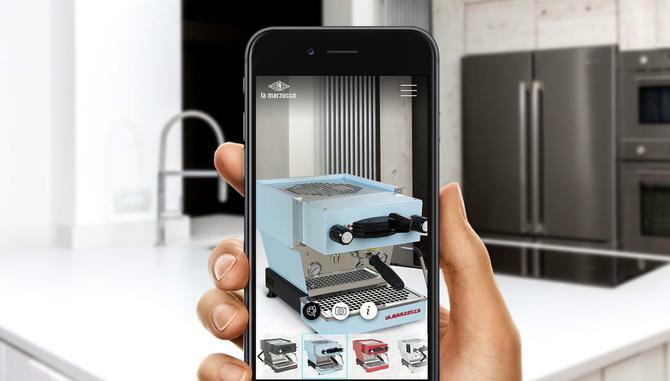 A home-grown augmented reality (AR) marketing app has been chosen to support the latest customer engagement efforts of Italian espresso machine manufacturer, La Marzocco. Plattar’s AR platform is being used to help consumers to see how an espresso machine would look in their kitchens prior to purchase. The product in question is the Linea Classic, a miniature version of La Marzocco’s commercial espresso machines used by cafes, restaurants and bars. The app is available via a mobile device or wearable and allows the user to place the machine in a physical environment. La Marzocco Australia general manager, Tom Beaumont, said the new app is targeted at consumers wanting to bring the café experience home. “With this AR platform, customers can use their phone’s camera to place the La Marzocco machine on their kitchen bench and not only be able to see which colour machine they like the look of, but also explore the attention the attention to detail in the quality craftsmanship of the machine, which is handmade in Florence,” he said. A second phase of the app will then provide a guide for buyers on setting up their new coffee machine, accessing online barista classes and accessing other educational content and blogs. Plattar is an Australian startup that provides a cloud-based platform for creating, managing and distributing AR reality content. Its founder and CEO, Rupert Deans, said La Marzocco is a great example of how AR can be used to help customers visualise products and drive purchase. “We knew that La Marzocco’s espresso machines would look amazing in an AP application and wanted to help them build a simple platform for their customers to experience the digital versions of these machines,” he said. Deans added the digital reality space is rapidly evolving, noting giants such as Apple, Facebook, Google, Microsoft and Alibaba have all invested billions of dollars into building out augmented reality solutions. Another recent Australian example of AR in action is RedBubble’s AR-enabled shopping experience app, allowing users to place virtual furniture and accessories in their living rooms as well as try on clothing for the right fit and colour.